I’m going to say this right off the bat, but my favorite scene in this comic goes to John Stewart negotiating with General Zod. In the previous issue we got a small glimpse of this scene. 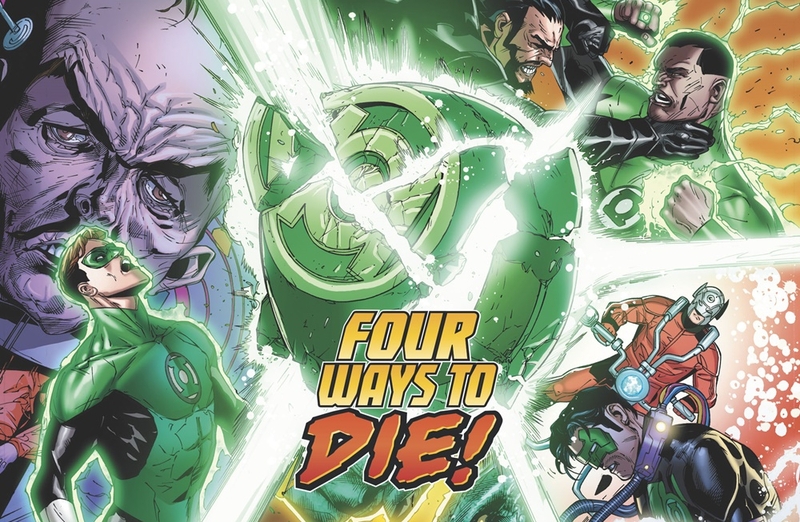 The sheer tension is incredible, it’s a testament to Venditti that manages to bring in Zod’s history with the Green Lanterns and give the reader why Zod shouldn’t trust the Green Lanterns, and I love that Zod doesn’t buy into what John is selling. After General Zod can pretty much handle himself. Which of course leads me to John’s handling of this situation, and it’s scenes like this that demonstrate why he’s in charge. I even love that he goads Zod into potentially fighting against the Darkstars is that Zod might get a chance at some revenge for his people by fighting Tomar-Tu. Even though I feel like that’s a bit out of character for John to something like this, given the context of their situation it John needed Zod no matter what. Even if that means sicking a Kryptonion terrorist on his former friend. Now one other aspect that needs to be discussed is what happens to Guy. Before I do get into that, it was really enjoyable to see Guy and Arkillo pal together again. Even after a year apart (our time), these two characters both have a weird chemistry together that I simply don’t understand. However it’s this scene that has me the most confused, and it’s Guy Gardner willingly join The Darkstars. I’ll admit that I was completely shocked but I feel like that this moment was a bit unearned. Perhaps the reader is supposed to know Guy’s past to understand why he would agree to this ordeal, but I’ll argue that readers don’t have to know that. If Guy throughout this arc had shown some sympathy for the Darkstars, then maybe this moment could have had the bigger impact that it needed. Another interesting character choice is relating to Hector Hammond, I could be remembering things wrong but I don’t remember Hammond wanting to be a hero. I remember Hector being jealous of Hal after his transformation but this Hammond feels like a different character. Perhaps I missed something that happened to Hector that caused him to want to be heroic, that’s on me though. If anything I can’t wait to see how Hector interacts with the rest of the GLC and of course the Darkstars. Rafa Sandoval tags out for this chapter, but Ethan Van Sciver tags in and the quality remains excellent. I’ve already discussed my favorite scene the standoff between Zod and John and a huge component of that goes to Van Sciver’s pencils. The body posturing and facial expression tell the story of these two alpha men playing verbal chicken with each other. The slight smirk that Zod has as discusses his past with the Green Lantern Corps is a small detail that is greatly appreciated. I know that Van Sciver’s pencils will be praised for their amazing detail, but his storytelling is what makes him a great artists.